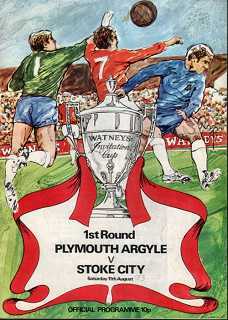 The Watney Cup was a short-lived pre-season tournament sponsored by the brewers of the same name. The teams scoring the most goals in each of the four divisions in the previous season were invited to take part. The introduction of the penalty shoot-out was its lasting innovation. Jimmy Hinch trying his best - didn't he always, bless him. The first chance is set up by Johnny Hore, and the second, a cross from Colin Sullivan. Also have a look out for Alan Welsh, Steve Davey, Ernie Machin and Derek Rickard.